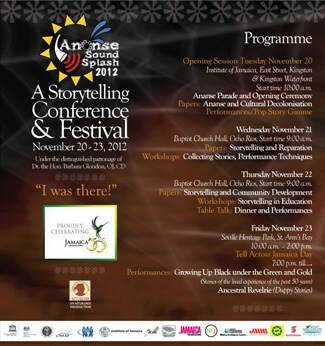 On the 19th of November I’ll be boarding a plane heading to Jamaica to attend a Storytelling Festival & Conference. I’m excited because I won’t only be performing but I’ll be presenting a paper as well. I’ll make the paper available online as soon as the conference starts. When most people think of traveling to Jamaica they dream of the country’s beaches, scenic landscapes and Bob Marley. When I think about visiting Jamaica I think about cow horns, Maroon Societies, Marcus Garvey and Walter Rodney. I am looking forward to communing with like minded intellectuals, celebrations of ancestry and listening to enlightening minds speak. I am hoping to learn something from each and ever soul that I cross paths with, whether they be the cab driver, government diplomat or children. As usual, when I travel, I’ll make sure to blog each day from the conference. I appreciate each and everyone of you who have followed me on these treks around the globe.